"There seems to be an elephant in the room," a beard-less Lincoln said at Comic-Con Friday in officially announcing his exit. "This will be my last season playing the part of Rick Grimes." He added: "I love this show. It means everything to me. I love the people who make this show. I’m particularly fond of the people who watch this show. I'm really, really excited about this season. No one is bigger than the story, and the story this year is unbelievable." 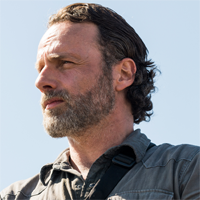 Lincoln did say his "relationship with Rick Grimes is far from over," prompting speculation of another Walking Dead project. "It's been everything to me for 10 years," said Lincoln, referring to his cast members as his "surrogate family. "I believe in the story so much that I can't spoil it for you. This is a really terrific season." AMC orders a third Walking Dead series to premiere in 2020, revolving around "two young female protagonists"